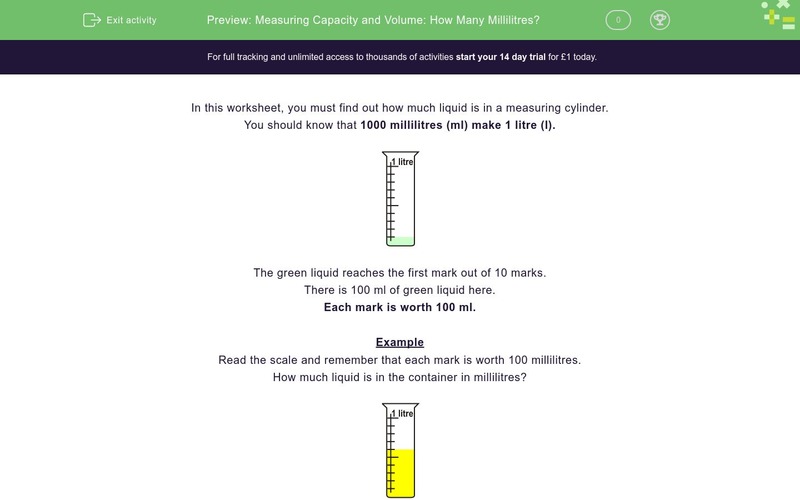 In this worksheet, students find out how much liquid is in a measuring cylinder. In this worksheet, you must find out how much liquid is in a measuring cylinder. You should know that 1000 millilitres (ml) make 1 litre (l). The green liquid reaches the first mark out of 10 marks. There is 100 ml of green liquid here. Each mark is worth 100 ml. Read the scale and remember that each mark is worth 100 millilitres. How much liquid is in the container in millilitres? The liquid reaches the 6th mark. Read the scale and remember that each mark is 100 millilitres.